The road leading to Pelican Point in the Qu'Appelle Valley in Saskatchewan, Canada runs along the shoreline of Last Mountain Lake. The small community of Pelican Point is located on a point of land overlooking Last Mountain Lake with a population of under 20 residents. The lake is approximately 70 kilometers long and during the summer months, people come here to boat, sail, swim, fish and enjoy the beauty of the Qu'Appelle Valley. This quiet shoreline road is one which is becoming busier every year as more people come to Last Mountain Lake for a vacation and new roads could alter the landscape and natural wilderness of the Qu'Appelle Valley. 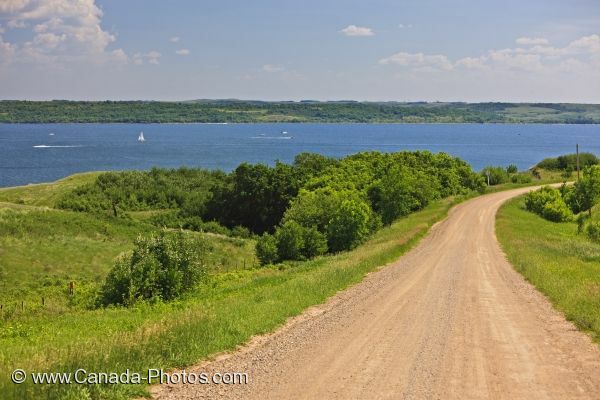 Road leading to Pelican Point on the shores of Last Mountain Lake, Qu'Appelle Valley, Saskatchewan, Canada. Picture of a shoreline road along Last Mountain Lake towards Pelican Point in the Qu'Appelle Valley, Saskatchewan.